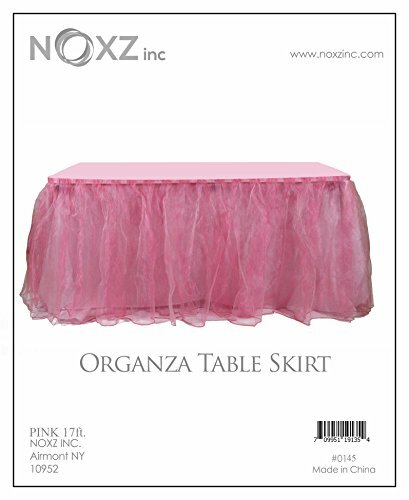 NOXZ Inc Organza Table Skirt for Every Occasions, Pink - 17 Ft.
► If Give a Fantastic and attractive look to your Lunch or Dinner table by using this occasion Organza table skirts. NOXZ Inc table covers makes the presentation of food better. Our table skirts give a professional and beautiful finishing touch to Your parties. We give you the Choice of colors by providing you this product in five different colors. Display tables with our table skirt cloth to give your wedding or events a formal presentation. Table covers are machine washable and stain and wrinkle resistant. It brings for you a wonderful and unforgettable day. "Table skirt decoration" Protects your Table from Stains and Scratches. ►Best Fit For 8 and 6 Ft Table. ►It is for all type of parties. ►Can be used in Banquets and Restaurants. ► NOXZ Inc dedicates to provide Amazon customers with excellent service and good quality products. ► NOXZ Inc is proud to be an independent company featuring a beautiful collection of superb Products. ► We pride ourselves in offering only the highest in quality so please order with confidence: Being an authorized seller with thousands of satisfied customers, we are here to serve you. Please contact us with any questions. We appreciate your business. " ► 100% brand new and high quality. ► Easily Handwash. Skirt clips and table covers sold separately. ► Choose your desired color from our best and highest quality Table Skirts. View More In Disposable Table Covers. If you have any questions about this product by NOXZ Inc, contact us by completing and submitting the form below. If you are looking for a specif part number, please include it with your message.